For really heavy death metal etc. I maybe wouldn't recommend this amp first although like I said, it can do those things, just not as well as some other amps. Re: NAD/Review: Brent Hinds Terror! I liked the Hinds quite a bit and I'll probably grab one eventually. The rocker 32 just made more sense to me at the time and has some awesome versatility, but the Hinds surely has more tonal variation. Neither is superior to the other, just different. I'm also looking at the rockerverb next as well after living with a dark terror for awhile. You cannot go wrong with an Orange, unless you're one of those freaks who chases ice pick in the ear, God awful fender tones with no mids and a flat assed bottom end. I have one too, bought it as soon as it was available right after they announced it at the NAMM in Feb this year, at first I was not completely sure about it and decided to exchange it only after 3 days for the Rocker 15. But then around early summer I found myself wanting it again, guess I was looking to complete my Orange Terror lineup; Jim Root, Dark Terror, Micro Dark Terror, Rocker 15 Terror, so I got the BH Terror back (only the ones with FX Loop as my pedalboards are split signal chains). And for some reason I now love it especially when I pair it with my two EVH 5150 III 112s, those Celestion 70th Anniversary speakers are so dynamic and work very well with Orange Terrors. I guess my initial feelings on it were based on these two new additions to the Orange Terrors not designed as "high gain" amps. But that really doesn't matter to me since I use overdrives and boost with all amps and I quickly got over it. But all in all, its a Terror no doubt. Has the same qualities that make Orange Terror lunchbox amps so great. I agree, while the Rocker 15 & BH Terrors are sister amps, same design, and both introduced together, they each possess their own voice and ultimately have unique tonal characteristics. Having been used to single channel amps for so long, I almost forgot what my guitars would sound thru a crisp clean channel amp, these two amps having the "Natural" channel were exhilarating when I first heard it and downright welcomed. The right speaker cabs and pedals used (or not) with this amp will get you whatever genre of music you seek. Sounds like a good amp. I have one too, bought it as soon as it was available right after they announced it at the NAMM in Feb this year, at first I was not completely sure about it and decided to exchange it only after 3 days for the Rocker 15. But then around early summer I found myself wanting it again, guess I was looking to complete my Orange Terror lineup; Jim Root, Dark Terror, Micro Dark Terror, Rocker 15 Terror, so I got the BH Terror back (only the ones with FX Loop as my pedalboards are split signal chains). And for some reason I now love it especially when I pair it with my two EVH 5150 III 112s, those Celestion Heritage speakers are so dynamic and work very well with Orange Terrors. I guess my initial feelings on it were based on these two new additions to the Orange Terrors not designed as "high gain" amps. But that really doesn't matter to me since I use overdrives and boost with all amps and I quickly got over it. What's your impression of the Amps using the loop? I've found the micro dork, Jim root and the rocker 32 all love my hall of fame and flashback. They take the chorus really well and dig the metal zone in the loop(don't laugh, it really does sound amazing). Up front they all seem to love fuzz like the RAMs head and big muff and any boost pedal with the gain turned down to zero. But I don't like coloring my Orange amps with any crunch or distortion that's got the gain dialed in. That suits my Marshall, egnater and Blackstars much more. I never consider using modulations, delays, and reverbs outside of the FX Loop, even the Phaser although some would argue that it sounds better in the front. 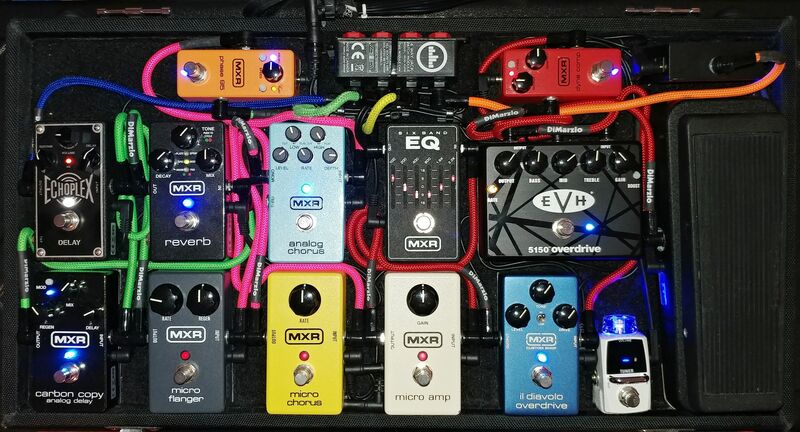 All of those FX on both my boards go thru the loop (my two boards have split signal paths for preamp and fx loop chain, I use the 4-cable method. Of course, in preamp are all my overdrives, boosts, wah, and EQs. These amps, except for the Micro Dark, obviously, have a buffered FX Loop with its own dedicated tube, the 12AT7, that provide the loop with a more natural, warm, and balanced tone. Since yesterday I've been messing around with some boutique FX pedals I ordered this past weekend, GAS never ends, and they sound off-worldly thru these amp's fx loop. I told you, been messing around with some mind tripping psychedelic cosmic space signal sounds, looks like I'm getting into ambient/prog rock/new age stuff! Can't live without FX Loop, its why I don't own the Dual Terror or original Tiny Terror. Thanks, I know I tend to go overboard, even for a non-pro casual jammer like myself. But what fun would life be if hobbies like ours didn't exist for you to spend all your time and all your money on! The main part is having fun and enjoying, gigging or in your practice room. Whatever you do, it's got to be fun. Sounds like you're doing it right!!! !